A Small 8 Bay Home Nas / ESXI Server is something I had been wanting to build for a while. 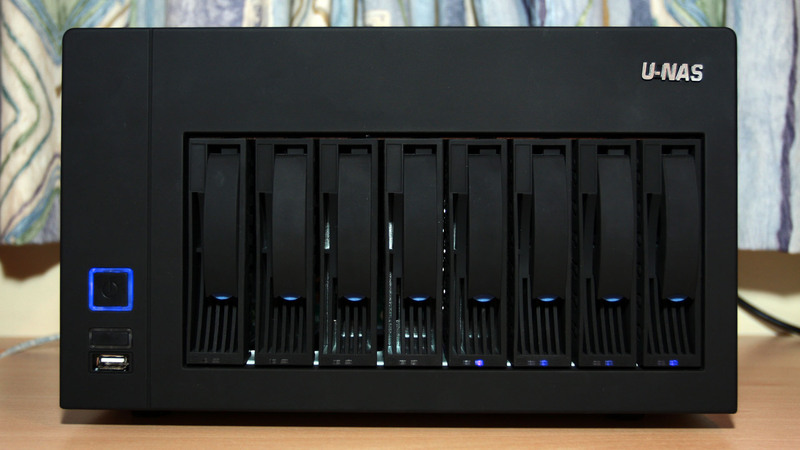 Unfortunately small and 8x 3.5″ drive bays are not something that can be often found together in the same sentence when looking to build your own home NAS / ESXI Server Build. The SAS breakout cables were already fitted in the case, so all I required was an actual SAS SATA / Raid controller. The most important thing here was the 8x SATA drive bays which i could fill with large 3.5″ drives with space for an internal 2.5″ hard drive / SSD for installing the OS on, or the data store for virtual machines when running Vmware ESXI in my case. The PCI Express expansion slot would be perfect for a SATA / Raid controller which would be essential to connect up the 8x drives, finally i could fit a Mini-ITX motherboard with all that in the case. 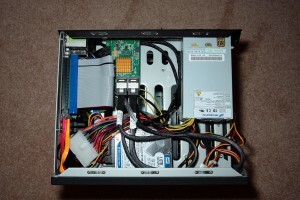 This was perfect as i could use the 4x 3.5″ drives from my HP Proliant Microserver and the existing motherboard, ram, processor and 2.5″ drives from my VMware ESXI Low Power Home Server Lab Build, essentially combining my NAS and ESXI servers in to one small server, with room to expand as my storage needs grew. I purchased the U-NAS NSC-800 directly from the manufacturers website, it was shipped to the UK via FedEx which took a week, as expected i was charged import duty which i believe was about £25. I think in total I spent about £150 on the U-NAS NSC-800 case, which I guess is not too bad when you consider the price of other high end cases. It was more than i would have liked to have spent, however given the U-NAS NSC-800 is such niche product I was happy enough. I didnt really have too many problems building in the U-NAS NSC-800 case, the 1U FLEX 250W PSU i had purchased wasnt really the best fit for the case (which i never realised when purchasing) however with a tie wrap it could be held firmly in place. Not exactly a professional solution, however it worked well enough. Getting the motherboard in to the side of the U-NAS NSC-800 was tricky, as i had to connect everything to the motherboard, then slide it down the case and screw it in, been careful no wires went over, or near the CPU cooler. I wouldn’t want to be doing that often, however simply taking your time is the key here. 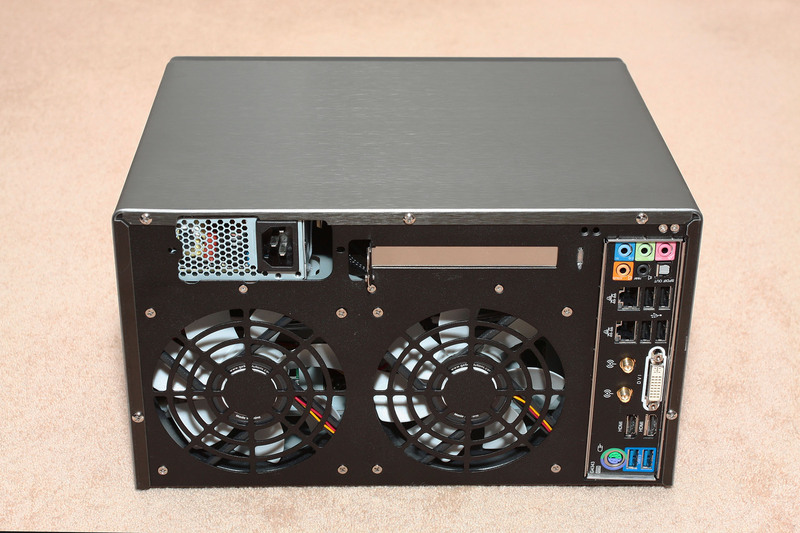 Back view of the finished U-NAS NSC-800 build, the 2x 120mm back fans keep everything nice and cool. View of the internals, the PSU wiring makes it look kind of messy, however everything fits in great and is nice and neat. The SSD is mounted below the hard drive you can see in the bottom middle. For the reasoning behind my hardware choice I would recommend you have a read of my previous blog: VMware ESXI Low Power Home Server Lab Build to summarise however it was been able to have a server capable of running Vmware ESXi, that had a fair amounts of CPU power behind it, however didn’t use excessive amounts of CPU power when idle. Power usage tests and more are included in the blog post i liked to. The Corsair 120GB Force 3 SSD was taken from a PC i had recently upgraded, if i was building this today I would get a larger SSD and not bother with the Western Digital Scorpio Blue 1TB Hard Drive as a secondary datastore. Small 8 Bay Home Nas / ESXI Server Build Software Configuration / What Do I Use It For? The server boots VMware ESXi 5.5 from a USB drive which is mounted internally. ESXi has two data stores for Virtual Machines, the SSD has a Windows Server 2012 Essentials R2 VM which acts are the “Home Server”. This has the HighPoint Rocket 2720SGL SATA controller passed through to it, giving the Virtual Machine direct access to any of the hard drive present in the 8x drive bays. I currently have 4x 4TB drives in the server. The majority of this space is used for TV Show and Movies i have ripped from Blu-rays / DVD’s (legal to do here in the UK), downloads and of-course daily backups from each of the PC’s around the home. I have Plex Media Server installed which will share my entire media library to any device around the house running Plex Home Theater, XBMC or even a web browser. Thanks to the processing power of the Core i7 3770T the server is more than capable of transcoding media in real time for playback on any device, no matter what codecs it supports. Also setup is a SFTP server which receives automated webserver and MySQL backups for various websites I have hosted on a dedicated server elsewhere. I have an Ubuntu Server 14.04 LTS VM which runs OpenVPN so i can securely connect to my home network from remote locations, or simply browse the internet securely when in a public location. Finally i have an old Windows Server 2003 VM which is running a dedicated game server for Unreal Tournament 2004. This server was setup back in 2008 originally on a dedicated server paid for by myself and three other friends, however as upload speeds have gradually improved on home broadband connections and people lost interest in the game i ended up hosting this at home. I do plan to also set-up a PFSense Virtual Machine so the server can also be my home router. The Gigabyte GA-Z77N-WIFI motherboard has two on-board gigabit NIC’s so one of them will be directly connected to the modem and the other a switch, really making this server the centre of my home network. I also have various other VM’s for leaning and experimenting with, pathetically useful as i have been experimenting and learning more about Windows Server, having a virtual network has certainly been handy for this. I have been really pleased with my U-NAS NSC-800 small 8 Bay home nas / ESXi server build, It’s been around a year since I originally set this up and it has run 24/7, sat in a cupboard ever since then. The only time the server has been off is for an afternoon where I had a power cut which lasted around an hour. With the new 6TB hard drives that are now entering the market i could get up to 48TB of storage in to this small home nas, more than i would ever need in the near future. For my own personal use this has been a great asset for learning, powering my home network and of-course storing all my data / backups. I have still only used 4x of the bays, so i think its pretty safe to say i’m future proofed for the foreseeable future anyway! What software do you use to manage your nas? FreeNas? Windows Server 2012 R2, I have various network shares which certain users have access to, along with a couple of guest shares. 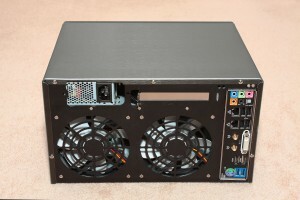 I was planning on building a similar server, but I would be using 3x15000rpm sas drives in a raid,connected to a dell perc 6/i controller. The processor and mainboard will be the same. I’m afraid about the heat, because these drives are much faster than normal ones. What can you tell me about refrigeration in that case? 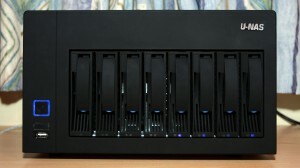 They server will be used 24×7 as a NAS storage. The 2 x 120mm Back Fans on the back of the case shift some air, the case always feels cool and i’ve had no problems with running 5x 7200rpm drives for around 2 years. If i could give you any temps I would do, however ESXi wont report them. Hi Matt, I’ve been trying to source this case in the UK for a while now. 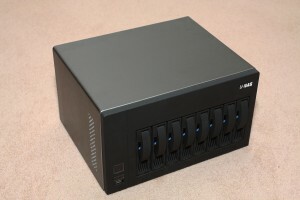 Would you mind sharing where you purchased your U-NAS NSC-800? Thanks! Be warned I had to pay import tax, which was around £25.